The photo was taken in 1998 or thereabouts within the Lake Mburo National Park, Uganda. 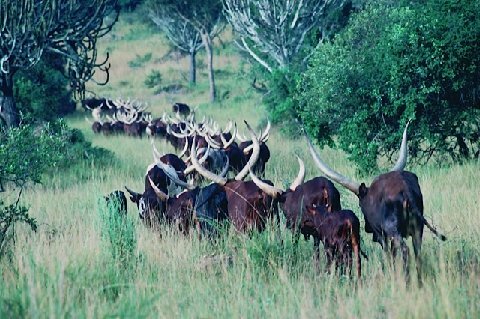 At that time there were many such beautiful herds but they are increasingly rare outside the ranches of the Bahima elite. The majority are unable to continue to keep such herds because they are settled on small plots of land, with limited water and need to earn revenue for school fees and such like from milk. The majority are therefore cross breeding with exotic breeds to increase milk and meat production.